Size - Height at withers, 8 to 11 inches. Fault - Over 11 inches. Disqualification - Over 12 inches. Proportion - Body must be slightly longer than the height at withers. It is not a cobby dog. Weight is in proportion to height. Substance - Of fineboned structure. Always parti-color or white with patches of any color(s). On the head, color(s) other than white must cover both ears, back and front, and extend without interruption from the ears over both eyes. A clearly defined white blaze and noseband are preferred to a solidly marked head. Symmetry of facial markings is desirable. The size, shape, placement, and presence or absence of patches of color on the body are without importance. Among the colors there is no preference, provided nose, eye rims and lips are well pigmented black. The following faults shall be severely penalized - Color other than white not covering both ears, back and front, or not extending from the ears over both eyes. A slight extension of the white collar onto the base of the ears, or a few white hairs interspersed among the color, shall not be penalized, provided the butterfly appearance is not sacrificed. Disqualifications - An all-white dog or a dog with no white. Height over 12 inches. An all-white dog or a dog with no white. Click Here to Learn about breeder background checks on Papillon breeders if you are looking for Papillon puppies for sale. Click Here to learn how ResearchBreeder.com can help you find healthy Papillon puppies for sale. Click Here to order a Breeder or Kennel Background Check on Papillon Breeders that may have Papillon puppies for sale. 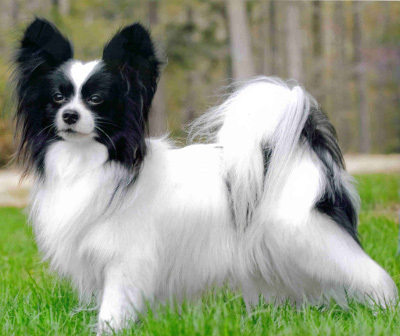 Click here to find the national breed club for Papillon puppies for sale. Click Here to purchase a list of approved ResearchBreeder.com Papillon Breeders who have Papillon puppies for sale.